Are you stocking up on snacks for back to school? 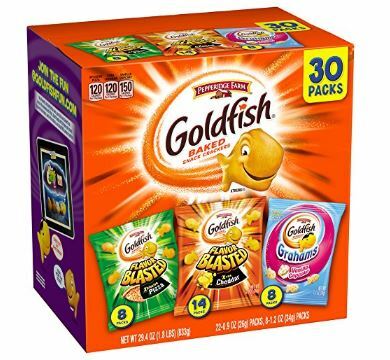 This 30 count box of Goldfish Classic variety packs is only $9.98 SHIPPED if you select Subscribe & Save for another 5% off and you get FREE shipping! BUT clip the 20% off coupon before adding it to your Subscribe & Save order and you’ll get it for just $7.58! That’s just $.25 per bag of snacks! You can’t beat that price! Subscribe & Save is FREE and you aren’t under any obligation to purchase the product again. Just cancel your subscription to the item. If you choose any FIVE Subscribe and Save items in one month, you’ll save 15% instead of 5%. That’s another $1.00 off this product making them only $6.58! Check out this post on how Subscribe & Save works and get a peek at my Subscribe & Save order!